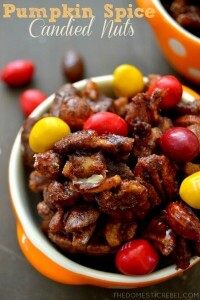 A simple candied nut, sure to please a crowd. First and foremost, liberally grease your slow cooker with cooking spray. Place the nuts in the slow cooker and set aside. In a small bowl, whisk together the egg whites and vanilla until combined. Drizzle over the nuts in the slow cooker and use a spoon to toss the nuts in the egg white mixture until coated. Meanwhile, in a larger bowl, combine the sugars and spices and stir to combine. Pour over the nuts and gently toss to coat. Turn the slow cooker on LOW and cook for 3 hours, stirring every 20 minutes. During the last 20 minutes of cook time, drizzle in the water and toss to coat. Once nuts are done, spread onto a foil-lined baking sheet to dry and cool. Sprinkle with M&M's as they cool or after, up to you. Break into clusters and serve. Use 6 cups of Country Spoon's Deluxe Nut Mix, available at the Red Barn to make this recipe even easier!